↑ Somerville, Keith (2002-09-26). "W African elephants 'separate' species". BBC. ↑ Vartanyan, S. L.; Garutt, V. E.; Sher, A. V. (25 March 1993). "Holocene dwarf mammoths from Wrangel Island in the Siberian Arctic" (PDF). Nature. 362 (6418): 337–340. doi:10.1038/362337a0. 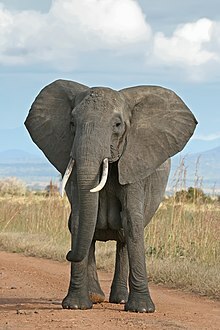 ↑ "African Elephant". National Geographic. Retrieved 2007-06-16. ↑ Fenykovi, Jose (June 4, 1956). "The Biggest Elephant Ever Killed By Man". USA: CNN. p. 7. ↑ "Animal Bytes: Elephant". San Diego Zoo. Retrieved 2007-06-16. ↑ Bate, D.M.A. 1907. On Elephant Remains from Crete, with Description of Elephas creticus sp.n. Proc. zool. Soc. London: 238–250. ↑ Jennifer Viegas (2011). "Elephants smart as chimps, dolphins". ABC Science. Retrieved 2011-03-08. ↑ Jennifer Viegas (2011). "Elephants Outwit Humans During Intelligence Test". Discovery News. ↑ "What Makes Dolphins So Smart?". The Ultimate Guide: Dolphins. 1999. Retrieved 2007-10-30. ↑ "Mind, memory and feelings". Friends Of The Elephant. ↑ Scott, David (2007-10-19). "Elephants Really Don't Forget". Daily Express. Retrieved 2007-10-30. ↑ Joubert D. 2006. Hunting behaviour of lions (Panthera leo) on elephants (Loxodonta africana) in the Chobe National Park, Botswana. African Journal of Ecology 44:279–281. ↑ Loveridge, A. J.; Hunt, J. E.; Murindagomo, F.; Macdonald, D. W. (2006). "Influence of drought on predation of elephant (Loxodonta africana) calves by lions (Panthera leo) in an African wooded savannah". Journal of Zoology. 270 (3): 523–530. doi:10.1111/j.1469-7998.2006.00181.x. ↑ "Great Plains". Planet Earth. Episode 7. November 2006.